You may have used the National Rail website to check departures. I've use the same source to bring Sydenham's three stations together plus linking them to local bus routes. As ever the project is to create shareable local data for local people so if you weant to embed them (unbranded) into your own websites etc just follow the share/embed links. Please PM reports on errors and omissions. Sorry, Stuart, perhaps I'm missing something, but I don't understand what the point of this is. The three Sydenham stations are quite far apart. They share a name, but that's about all. Penge East is closer to Sydenham station, Gypsy Hill closer to Sydenham Hill, and Lower Sydenham closer to Beckenham Hill. Also, the three stations terminate at three different destinations. I'm sure this is well intentioned, but I can't see how it would, in practical terms, help anyone. If it's of no use to you then no worries. If it helps only one then it's a bonus. I live in Lawrie Park and regulary use Sydenham & Sydenham Hill (or pick up at Penge East/West). I occasionally use Lower Sydenham/New Beckenham - so its great for me. Even if you use only one station it can be easier, faster plus ad & tracking-free to use than the NatRail app. One of the reasons for assembling this information (trains and buses being only a small part) is to help newcomers and potential newcomers find out what part of Sydenham would work for them. When I moved here I hadn't a clue about public transport but then realised by accident I had found a sweetspot for the type of travel I do. This gives a live picture. Also surprisingly even longstanding residents can be hazy outside their narrow regular corridor of travel. Can they name the frequency and London terminals the other two serve? And what buses? Vital information when one of the lines has an incident. Remember Forest Sinkhole? Just compiling the three pages unearthed some helpful travel routes I was unaware of including the N63 night bus should the 176 fall on hard times. Not sure whether I'll actually use this but I live between Sydenham and Sydenham Hill stations and often decide on the fly which one to use - this seems a quick way of assessing what's actually going on at the time. And then making a decision as to travel routes. But do not be too quick to wean people off Explorer - only this week I used every modern browser to try to use a measuring feature on an online mapping subsystem provided by a local authority. The measuring system would not work consistently until I fired up old reliable Explorer. They are not all operating to a uniform standard yet. Oh JGD - the only reason we have Internet Exploter is because legacy sites who didn't use cross-browser standards are stuck. Microsoft's own advice is to use Edge except when you can't. Windows 7 users don't have that option but then its a dying platform with an EOL of next January. Until then they may be best advised to use Chrome as their default browser (which is what the new Edge is based on anyway). Keep IE for those old sites. Last edited by stuart on 13 Apr 2019 10:26, edited 1 time in total. 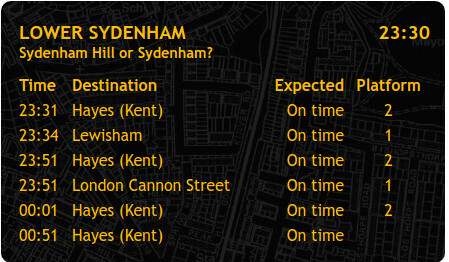 The default, on the National Rail system, is to offer all Sydenham stations and offer alternatives. That, to me, is a nuisance. I have, each time, to remove the alternatives and select "Sydenham London". A most annoying feature of the National Rail system is that it frequently offers circuitous routes... via Norwood Junction from London Bridge etc. If you are tempted to use the TFL facility I implore you not to. There lies the quick route to insanity. Stuart, excellent stuff, I've started using your link and also passed onto others. Probably the most informative post I've seen on this forum. Many thanks. Came in very handy this afternoon - although I couldn't work out whether it was actually showing any services on the Orpington line or not. Certainly there was no sign of Orpington-bound trains - I'd have expected a "cancelled" notice.